Chandigarh: China is expanding its access to strategic foreign ports like Pakistan’s Gwadar and Sri Lanka’s Hambantota to pre-position the logistic framework necessary to support the growing presence of its military in the Indian Ocean and beyond, the Pentagon has said. 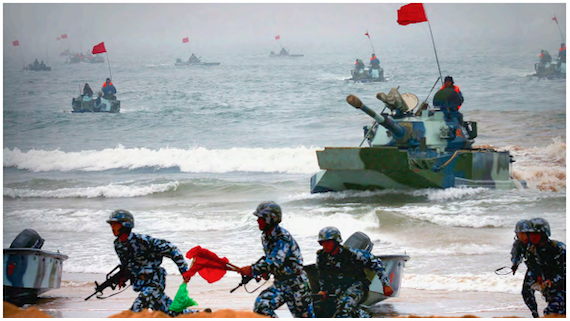 PLANMC units conduct an amphibious assault during a training exercise. The People’s Liberation Army’s efforts to obtain access to commercial ports in Africa, the Middle-East and South Asia would align with its future overseas logistic needs and meet its evolving naval requirements, said the Congressionally-mandated report on the increasing Chinese military power which was released by the US Department of Defence on Tuesday. Taylor pointed out that the PLA is not actually a national institution in China, but rather the military arm of the Chinese Communist Party. About 3 million serve on active duty in the PLA, making it the largest military force in the world. Additionally, it’s thought the PLA receives about $200 billion a year in funding — about 1.4 percent of China’s gross domestic product — though lack of transparency means exact numbers can’t be determined. Following the Gulf War and the fall of the Soviet Union, Chinese leaders perceived a period of strategic opportunity, the report says.” Convinced they would not see a major military conflict before 2020, China embarked on a period of economic and military development. Professionalization of the PLA, with an increased push to focus on an ability to “fight and win” — a goal that mirrors U.S. doctrine — has been a hallmark of Chinese President Xi Jinping’s recent military strategy, said one defense official speaking to reporters on background. “Xi Jinping has made it clear that resolving or making progress, at least, on resolving … the Taiwan situation is a very top priority for him,” the defense official said.